Tips and solutions for SONY XPERIA Z ULTRA ( C6802 / XL39h / C6833 / C6843 / C6806 ) problems. Having Android with bigger screen sometime more interesting for several people, not as big as 7 inches tablet, but still bigger that usual smartphone. SONY XPERIA Z ULTRA ( C6802 / XL39h / C6833 / C6843 / C6806) have 6.4 inches LCD screen is good choice for this needed. This smartphone will give wonderful color at lcd display because it have 1080×1920 resolutions also have new Triluminos display technology, same technology with SONY BRAVIA televisions. Battery at SONY XPERIA Z ULTRA ( C6802 / XL39h / C6833 / C6843 / C6806) also one consideration to buy this smartphone, becuase it have 3050 mAh battery capacity, quite enough for many advance user who use XPERIA Z ULTRA for hard work or entertainment. The SONY XPERIA Z ULTRA big waterproof smartphone with IP58 certified. How to Fix or Problem Solving for Recovery SONY XPERIA Z ULTRA ( C6802 / XL39h / C6833 / C6843 / C6806 ) hang or not responding or malfunctions or stuck or freezing or bricked ? When we see processor the specifications at SONY XPERIA Z ULTRA ( C6802 / XL39h / C6833 / C6843 / C6806), it almost the same with other new high end Sony family, because it have 2.2 Ghz processor and also have 2 GB RAM which is big and fast to run almost any applications that we can download from Google Play Store. But as we know, the bigger screen who not normal for some applications will make one problem at some applications. Other problem is about not all applications are have good compatibility with SONY XPERIA Z ULTRA, this situations can make trouble like hang or stuck or bricks or frozen or LCD touch screen not responding. Please try to solve the problem by doing soft reset or restart or reboot the smartphone to delete any temporary files or caches. If doing soft reset is not help, then try to do hard reset or master format. But please remember, doing hard reset will do full wipe or erase any important data and installed applications, so we need to backup all data before doing hard reset. How to Soft Reset or Reboot or Restart SONY XPERIA Z ULTRA ( C6802 / XL39h / C6833 / C6843 / C6806 ) ? The battery of SONY XPERIA Z ULTRA ( C6802 / XL39h / C6833 / C6843 / C6806) is non removable, so we can not doing soft reset or restart this smartphone by removing the battery. But do not worry because SONY XPERIA Z ULTRA ( C6802 / XL39h / C6833 / C6843 / C6806) have small button to help us doing soft reset easily, the small reset button place next to micro SIM card slot. Open the SIM card cover, and the button will be shown next to the slot. This small button will help us doing force soft reset or restart while the SONY XPERIA Z ULTRA ( C6802 / XL39h / C6833 / C6843 / C6806) hang or stuck. Other alternative to doing soft reset can be do if the phone still can be access, try to press power button several seconds, until menu appear. Choose restart/reboot than the SONY XPERIA Z ULTRA ( C6802 / XL39h / C6833 / C6843 / C6806) will do the soft reset or restart. This is safe to do because all data or installed applications will not removed. How to Force Soft Reset or Restart or Shutdown SONY XPERIA Z ULTRA ( C6802 / XL39h / C6833 / C6843 / C6806 ) when the phone totally Frozen or Hang or Nothing Can be Access in This Phone ? This step to force restart when the SONY XPERIA Z ULTRA ( C6802 / XL39h / C6833 / C6843 / C6806) have problem already said above, we can find small buttom next to micro SIM card locations, open the micro SIM cover, find that button and press to force restart SONY XPERIA Z ULTRA when frozen or stuck. The SONY XPERIA Z ULTRA ( C6802 / XL39h / C6833 / C6843 / C6806) will continue the step until ready to use in clean factory default. Finish the PC Companion step and until it doing Factory Reset to SONY XPERIA Z ULTRA ( C6802 / XL39h / C6833 / C6843 / C6806) to factory default Android operating system. How to Restore and Reinstall Clean Android Operating system / firmware at SONY XPERIA Z ULTRA (C6802 / XL39h / C6833 / C6843 / C6806) ? The default file source operating system or firmware of SONY XPERIA Z ULTRA ( C6802 / XL39h / C6833 / C6843 / C6806) already saved inside this smartphone ROM, that is why we do not need to copy any files when we need to do reinstall or restore the clean and factory default setting operating system or firmware when the problem happen with this SONY XPERIA Z ULTRA or when the operating system damage because of any situations. To do reinstall is easy, just try to follow some options to hard reset or master format above, then the SONY XPERIA Z ULTRA will be reinstall automatically. Wait less than 10 seconds to finish reinstall operating system and after everything finish, we need to do some step to activate our Google account and install some important applications for our daily activity. How to Unlock or Fix or Bypass or Solutions for SONY XPERIA Z ULTRA ( C6802 / XL39h / C6833 / C6843 / C6806 ) forgot password code or security lock screen pattern or pin (lost password)? We usually save many important data at our smartphone, because with Android we can keep more things like images, video or any text data or documents. This make us have aware to give more security protections when the SONY XPERIA Z ULTRA away from us. We can choose several choice for security protections, but we recommended to use Screen Lock Pattern or Password PIN protections. What about if we have forgotten our security protection answer? Do not worry because Google already have help button when we forgot the security protections. Please try to do several time wrong answer for security protection until the SONY XPERIA Z ULTRA ( C6802 / XL39h / C6833 / C6843 / C6806 ) frozen or locked about several seconds. The help Forget Password / Pattern button will be appear. Press this button then we will bring to answer Google account or Gmail account that has been saved before. If we can not access the Google account, the only way to unlock security protection is doing hard reset or master format. But please remember doing this step will delete all important data at our smartphone. How to Improve Performance SONY XPERIA Z ULTRA ( C6802 / XL39h / C6833 / C6843 / C6806 ) to make run more faster? The speed of SONY XPERIA Z ULTRA ( C6802 / XL39h / C6833 / C6843 / C6806 ) is fast to run many applications together, the big memory 2 GB RAM will make more room for doing many multitasking jobs. But some user maybe still have problem with SONY XPERIA Z ULTRA, which make the phone become more slowly than before. Almost all causes of this problem happen because many applications that we already installed in SONY XPERIA Z ULTRA make problem with this phone. Some applications many need many many resource that will make SONY XPERIA Z ULTRA become working hard and turn to slow. However, reducing the installation applications will help our smartphone back faster again. But if we need to make the SONY XPERIA Z ULTRA ( C6802 / XL39h / C6833 / C6843 / C6806 ) performance back to faster like new again, then we can consider to do hard reset or master format. Is That Any Secret Code for Doing Format SONY XPERIA Z ULTRA ( C6802 / XL39h / C6833 / C6843 / C6806 ) ? There is no secret hidden code for SONY XPERIA Z ULTRA ( C6802 / XL39h / C6833 / C6843 / C6806 ) to make it back to factory default. Do the options above to hard reset it. [A] Hi, as far as we know Sony Xperia Z Ultra have proper way to run Facebook applications. Please try to do hard reset or master format one more time from menu Setting. After your phone finish reformat, then please do not login with previous Google account to make your phone not restore any Google backup. You can try to create new Google / Gmail account to test several moment such as download Facebook. [A] Hi, please try to replace with another simcard to make sure the problems is not comes from your simcard. If still can not work, then please try to do hard reset using menu Setting, because it seems that your Sony Xperia Z Ultra still can boot normally. 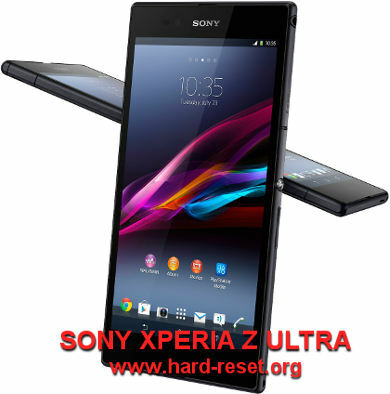 The information from this page describe about sony xperia z ultra hard reset,sony z ultra hard reset,hard reset xperia z ultra,how to hard reset sony xperia z ultra,xperia z ultra hard reset,hard reset sony xperia z ultra,how to hard reset sony z ultra,hard reset sony z ultra,how to hard reset xperia z ultra,hard reset z ultra. If you need another resource for hard reset, use search function at this homepage or find from our related posts. How to Easily Master Format HUAWEI P9 LITE MINI / Y6 PRO (2017) with Safety Hard Reset? How to Easily Master Format HUAWEI Y5II / Y5 2 (HONOR 5) with Safety Hard Reset? Hi, we are worry the problems or scratch that you said already happen at the LCD Digitizer. So some point can not read our finger touch. However, you can try download some applications from Google Play Store, use keyword search ‘lcd touch test‘. With this application we can try which point that can not response our finger touch at your Sony Xpria Z Ultra. If you are sure that positions can not response, then you can not fix this problem with hard reset, you should bring your phone to Sony authorize service center to replace the LCD Digitizer. Hi, please try to hard reset or reformat your Sony Xperia Z Ultra using PC Companion after download PC Companion applications from Sony official website. Install that software to computer PC which use Windows operating system (Win XP/Win 7/Win 8+). Then follow steps at #Options 4 above. Hi, better you try to do hard reset Sony Xperia Z Ultra using PC Companion, first you have to prepare computer with Microsoft Windows operating system, then try to download the PC Companion file source from Sony official website, then install at that computer. After everything done, then please follow steps at #Option 4 above to hard reset using PC Companion. My phone is not able to read the Sim card and I’m not able to make any calls. It’s says emergency calls only. Please help. Hi, maybe you can try to use different GSM simcard at your Sony Xperia Z Ultra. If that steps still not fix this probelms at your phone, then please try to do hard reset to reinstall and restore all setting of your Sony Xperia Z Ultra back to factory default. Hi, maybe you can try to reformat or hard reset your Sony Xperia Z Ultra using PC Companion like steps at #Option 4 above. You need to download that apps from Sony official website then install it at your PC Computer which use Microsoft Windows operating system. After that prepare USB data cable and follow steps at #Option 4 above carefully to hard reset your Sony Xperia Z Ultra. Hi, if the infrastructure of your network provider is not good, then you can try to switch to different network provider, maybe it will give better result to run your Sony Xperia Z.
Hi, you have to make sure your Internet connection is active when you want to bypass or unlock forgotten security protections at your Sony Xperia Z, because your phone will ask authentication with Google server for security purpose. Hi, if you never use custom rom, then after doing hard reset, your Sony Xperia Z will be reinstall official factory default operating system including factory default applications, usually all of them safe for Sony Xperia Z.
Hi, first you can try to unlock forgotten security screen lock pattern at Sony Xperia Z Ultra using Google account. Please turn on LCD screen, then try to give several time wrong answer continuously until your Sony Xperia Z Ultra locked or freezing 30 seconds. At this time you can find Forgot Pattern button, press that button and you can type your Gmail username and password that you have already signed-in before. Please make sure your Internet connection is active while unlock with Google account, because your Sony Xperia Z Ultra will ask authentication at Google server. If you still can not access your Gmail account at your phone, then you have to do hard reset using PC Companion software from Microsoft Windows computer, please follow steps at #option 4 above carefully. Hi, unfortunately we can not give good answer for rooted Sony Xperia Z because there are many non standard possibilities happen that can not solve with standard procedure. However, you can try to do hard reset using PC Companion with steps at #option 4 above. i have same problem with my xperia z. i was try use pc companion. but stil have some problem. Hi, usually after use PC Companion to reinstall your Sony Xperia Z operating system or firmware to factory default, then your phone will work normally again, unless it have hardware trouble. Please consult with Sony authorize service center to fix your problems. Hi, I do not understand about pro version applications. But if you have paid for some applications at Google Play Store, usually it can installed again once your Sony Xperia Z Ultra finish reformat without need to buy or pay anymore. As long as your Google account username and password is not different. Hi, please try to replace with another simcard to make sure the problems is not comes from your simcard. If still can not work, then please try to do hard reset using menu Setting, because it seems that your Sony Xperia Z Ultra still can boot normally. Hi, as far as we know Sony Xperia Z Ultra have proper way to run Facebook applications. Please try to do hard reset or master format one more time from menu Setting. After your phone finish reformat, then please do not login with previous Google account to make your phone not restore any Google backup. You can try to create new Google / Gmail account to test several moment such as download Facebook.